All three of these recordings were made between October 1948 and February 1956, a period which saw a fairly rapid escalation of audio-technological improvement. The Paganini Rhapsody was recorded on 78s, the Variations on a Nursery Song on mono LP and finally the Dvořák Symphonic Variations was released on an HMV stereo series. Presiding over all three is Malcolm Sargent, who had been active in the recording studios since the 1920s, and the perfect man for a piano soloist like Cyril Smith. When he wasn’t tiring himself out during the War undertaking innumerable concerts across the country, Sargent had also played as a pianist, and he understood very well how to provide a sympathetic accompaniment. Britain’s two best Rachmaninov pianists at the time were Moiseiwitsch and Smith. Moura Lympany, a rather different kind of performer, was later to join their number. The Rhapsody is single-tracked, and for ease of manoeuvring it would have been preferable to track the variations separately. Still, if you listen seamlessly and are not minded to reverse, the experience of listening to the still-new Philharmonia in fiery form, especially the string cantilever, the forward winds and the exultant brass, is hugely enjoyable. Smith, who had met Rachmaninov in the 1930s and was well versed in his performing style, plays in a strongly Rachmaninovian style, very much informed by the composer-executant’s own playing. His passagework is scintillating, his dexterity imperious. There’s something exultant about his and Sargent’s handling of the most famous of the variations. 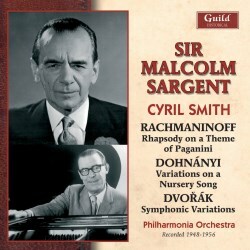 Rather like the composer himself, Smith and Sargent made two recordings of Dohnányi’s Variations. The earlier of the two was with the Liverpool Philharmonic. There’s very little in it interpretatively but sonically the Abbey Road mono takes the palm and Smith’s playing is marvellously communicative and witty. The Dvořák Symphonic Variations allows Sargent centre-stage in fine HMV Kingsway Hall stereo. This is not always an easy work to gauge, and its proportions can cause some lesser hands to misjudge its complex series of continuous variations. Sargent, however, like his friend and occasional verbal sparring partner, Thomas Beecham, has its measure. He also has the advantage of an orchestra in excellent form throughout all its choirs. The Paganini variations was reissued by Dutton [CDCLP4004] coupled with the Second Piano Concerto, with Sargent – which Guild has also reissued (review) – and the Suite No.2 with Smith’s wife, Phyllis Sellick. Two great British pianists suffered grievous strokes in 1956 – Smith and Solomon. Smith played on with one functioning arm and this disc reminds us quite what an outstandingly dynamic musician he was. Good transfers and notes enhance the experience.